Ashlar is stubborn, single-minded, talented, and determined to save Nicholas from the Order of Romulus. First, she needs to learn to control her emotions under the guidance of the Illuminati. 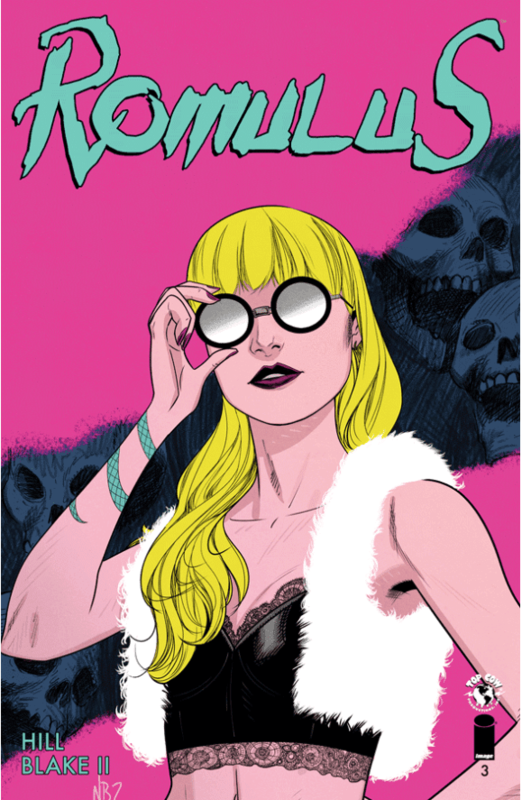 Meanwhile, a defiant Nicholas gets an interesting offer as Bryan Hill and Nelson Blake II continue to bring the exciting 'Romulus' series to new heights. The distinction between the two clandestine organizations is made clearer in issue three as well as where Ashlar's headspace is at. She is unrelenting and that makes her dangerous but without training any more confrontations against the Romulus could prove dire. Reluctantly, she succumbs to the training but it's still hard to tame a feral warrior like her. Those scenes are familiar but vividly captured through Blake's pencils. Few artists can lay out a fight scene like Blake does, full of fluidity and impact. Equally resistant to his situation is Nicholas. Remaining defiant to his captors, middle fingers up, Nicholas refuses to be a pawn in whatever game the Romulus are playing. It takes one slick-talking Romulus envoy to play to his ego to make him a surprising deal that changes the stakes. Hill's clever script reveals plot points about both factions that personify a chess game with each new tactic, a new piece is moved into place. The only wildcard remains Ashlar whose motivations and impulses may be too powerful to overcome. Again, Blakes' art is so clean and expressive that nothing goes to waste. It's all on the page, every dynamic fight sequence, every perfectly choreographed discussion, giving the story the cinematic effect it deserves. What is even more impressive is Blake's ability to capture the inner turmoil of Ashlar and Nicholas respectively with subtle variances in their expressions or body language. There's a lot going on with each of them and Blake's storytelling conveyed in pictures is masterful. 'Romulus' continues to evolve into one fascinating and exciting story with new revelations and motivations. Ashlar herself has room to grow and that makes this unique battle between warring factions all the more compelling. Hill and Blake are putting on a clinic on how to make a great comic. Pick it up now.